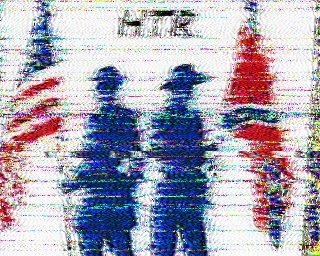 This Hardtack Radio SSTV image can be decoded at the end of the broadcast. For your listening pleasure: a 24 minute recording of the pirate radio station, Hardtack Radio. I caught Hardtack’s broadcast Friday night (April 12) around 23:10 UTC. Their upper side band signal was pretty strong and well above the active noise floor, though there was a heterodyne/data noise located right around 6926.8 kHz. You won’t hear this noise in the recording below, because I effectively used the WinRadio Excalibur’s notch filter to eliminate it. At the very end of the recording, I turn off the notch and you’ll hear the noise a few seconds before the broadcast ends. This entry was posted in Pirate Radio, Podcast, Recordings, What's On Shortwave and tagged Hard Tack Radio, Hardtack Radio, Pirate Radio, Pirate Radio Recordings, Podcasts, Recordings, Shortwave Pirate Radio on April 14, 2013 by Thomas.